Pellet stoves are also referred to as pellet furnaces. One of the primary benefits is that they are extremely energy efficient. They are also a green and sustainable technology appliance; they typically use wood scrap (pellets) or corn as a fuel. You have many choices for your homes heating systems today. First, you have the customary fireplace, with its traditional hearth and mantle, which is now mostly for comfort and show rather than whole-house function. Next you have space heaters, usually dedicated to smaller areas. Most popular is the central gas-fired or electric furnace. But lately, the pellet furnace (or stove) is gaining in market share because of how efficient it is and the fact that the fuel was likely scrap to start with, saving valuable land fill space. How does a Pellet Stove Function? 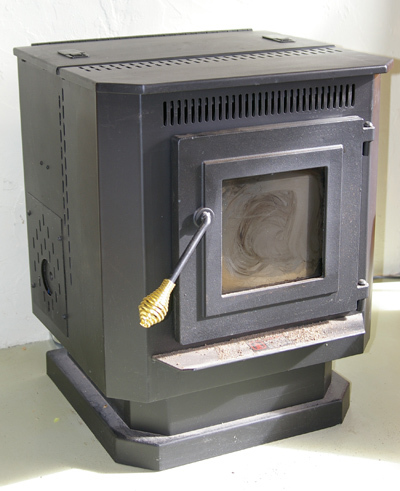 A pellet stove is a more complex than a typical furnace or fireplace. To feed the fuel, an auger, which is a type of large screw, is rotated by an electric motor. It slowly revolves, which transports the pellets from a hopper in which they are stored. 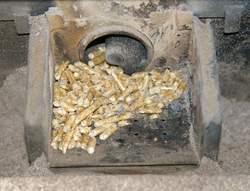 The auger is calibrated to deliver the pellet fuel into the fire at a set consistent rate. An electric fan delivers a stream of air across the fire in order to keep a preset temperature. It also ensures that the fuel burns as evenly and efficiently as possible. In addition, a separate fan propels the heated air, first through a heat exchanger, and finally into the homes living area. Meanwhile, noxious exhaust gases are produced by the burning. These gasses are vented away from the furnace by yet another fan via the exhaust pipe. One benefit of this system is that this pipe is narrower, less decorating, and much more economical to install than a fireplace chimney. The fact is that pellet stoves burn so efficiently and cleanly that even the US EPA (Environmental Protection Agency) gives them a pass for emissions testing. The fuel burn that is so efficient that they are by some thought to be the most clean burning of all heaters that burn a form of solid fuel. With British thermal units (BTUs) in the 8,000  90,000 range, pellet furnaces are easily found in a variety of sizes that will warm up not just smaller homes, but alrger residences such as apartments, townhouses, and condominiums as well. Pellet fuel is regarded a biomass fuel and the cost roughly only $3.50 for a 40-pound bag. Typically, the average home uses 2  3 tons of pellets each winter. You might ask why its so inexpensive. Its because pellets are for the most part composed of waste materials. Usually this is from sawdust from mills or cabinet shops, old wooden pallets, and leftover scrap from furniture factories. Yet another thing for the green and frugal among us to take into account is that because wood-derived pellets are a biomass fuel, this type of furnace qualifies for an energy tax credit when filing US federal tax returns because of being a sustainable appliance. The pellet stoves of today are outfitted with a high-quality thermostat. This allows for precise control of room temperature. It does this as adjusting the fuel delivery rate from the hopper via the auger. But going one step further and installing a programmable thermostat will yield even more energy efficiency. This way the furnace can be configured to automatically run at a minimum feed rate when your family is asleep or is away. As with every other commodity, there are drawbacks. The purchase price can be quite high due to all the moving parts. Although inexpensive models are available, a quality entry level furnace can set you back at least $1500. Even then, there is the installation cost including venting. One more drawback to consider is that if your electricity goes out during a snowstorm or a malfunction, two things are possible. First, the unit fails to perform since the auger will not rotate to fuel the blaze. Secondly, chances are it can also make smoke enter the home during some circumstances since the exhaust fan is electric. Finally, consider that because pellet furnaces are mechanical appliances, they are more susceptible to failing than a conventional fireplace or central HVAC system. As with all your mechanical appliances, a certain level of maintenance must be upheld. The bottom line? A pellet burning furnace will save money in the long run, but a backup system should be considered.